Ranger Tugs, OBX Boatworks, Campion Marine and Catalina recently announced new models that they will roll out at the winter boat shows. The new R31 will debut Jan. 26-Feb. 5 at the Seattle Boat Show in the Stadium Exhibition Center. Hull No. 2 is expected to make its East Coast debut Feb. 16-20 at the Miami International Boat Show at Sea Isle Marina on Biscayne Bay. The R31 shares many of the features and qualities of her smaller sister ships, but some notable additions to this larger model make her ideal for extended cruising while still being a trailerable trawler. The R31 is the first Ranger Tug to feature a flybridge equipped with electronic controls at both the upper and lower helm. The flybridge also retracts to allow for trailering. The first R31 will be offered at a base price of $279,937. Ranger Tugs is taking orders, and the first boats will begin to ship to dealers this spring. OBX Boatworks, in partnership with Outer Banks Boatworks of Harkers Island, N.C., expanded its manufacturing operation with a new composite boatbuilding factory in High Point, N.C.
OBX will present a new 32 Express in February at the Miami International Boat Show. 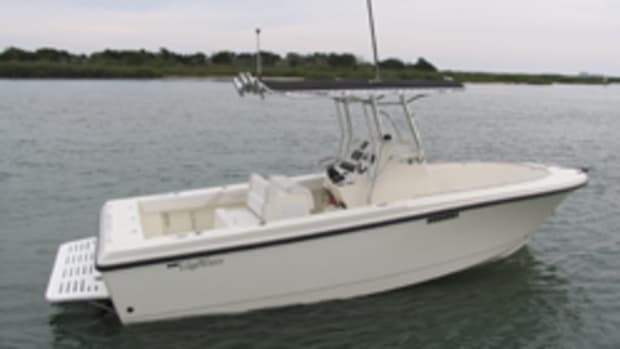 The 326XP is the debut model for OBX, and it will be followed by 38- and 29-foot express and 29-, 26- and 24-foot center consoles. Fishing is the main focus of OBX models, but the new models are also designed with the cruising family in mind. Each OBX will be semicustom and designed with the client so that all owners have a boat that is unique to their tastes. “I believe there is a great market for our products and we will capture significant market share because we have a great product that is unique in our industry,” owner Brad Flater said in a statement. Campion Marine Inc. of Kelowna, British Columbia, announced two new Chase outboard models; the 16-foot, 7-inch 500 and the 17-foot, 10-inch 530, as well as two new Chase I/O models: the 500i and 530i. “The four new Chase models were received well by our dealers at our 2012 dealer meeting and it shows with steady orders since their introduction,” Campion Marine general manager Brock Elliott said in a statement. The outboard version of the Chase 530 will be on display at the Toronto Boat Show, which runs through this weekend. Also announced were the Allante 485 and 535 Forster editions, which have many of the features of a bass boat. They have the diversity to be used for fishing as well having the capability of skiing, tubing and wakeboarding use, Campion said. The Allante 485 Forster edition also will be on display at the Toronto Boat Show. Catalina’s new designs, coined the Catalina 5 Series, are moving the brand to a higher level of performance, the company said, and the Catalina 315 is the newest in the series. Like all Catalinas larger than 30 feet, the new 315 is built to CE category A standards, is NMMA yacht-certified and follows all applicable American Boat and Yacht Council standards.